If I understand the history correctly, in the late 1990s, the President was impeached for lying about a sexual affair by a House of Representatives led by a man who was also then hiding a sexual affair, who was supposed to be replaced by another Congressman who stepped down when forced to reveal that he too was having a sexual affair, which led to the election of a new Speaker of the House who now has been indicted for lying about payments covering up his sexual contact with a boy. Yikes. 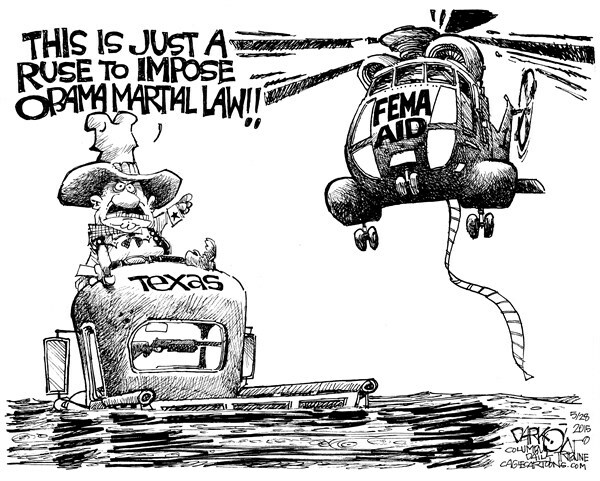 Yep, that pretty much sums up the flim-flam.
. . . and anyone who doesn’t realize that the hysterical wingnut myth of Obama martial law is rooted in racism–in the Secesh’s subconscious dread of another Nat Turner seeking revenge upon the oppressor and the wannabe oppressor–is a damn fool. Via The Bob and Chez Show Blog. Is it just me, or is the silly season starting early this year? Elizabeth Ann Harrison, 54, of Spring View Court was charged with third-degree assault and battery. She was placed in the Rock Hill city jail and released Thursday on a personal recognizance bond. No safe harbor . . . .
A husband and wife were injured Thursday after losing control of a gun while placing it into a new safe. Turns out we really can’t walk and chew gum at the same time. Too many cameras at too many events in the hands of too many narcissistic prima donnas leads to no good. A physical altercation between adults disrupted a promotion ceremony for hundreds of T.R. Smedberg Middle School eighth-graders at the Sheldon High School stadium Friday morning, triggering calls to the Sacramento County Sheriff’s Department, authorities said. . . .
Officers responding to the episode reported that the fight started when words were exchanged over one of the men blocking others by taking a photograph. Graduation ceremonies from middle school are silly and stupid. Second Son had a graduation ceremony from pre-school to kindergarten. That was also silly and stupid. Six-minute cartoons that are three hours long. Who woulda thunk? One more time: Republican Family Values (TM) are a con, a fraud, and a flim-flam, hot air you can use to dry your socks, as a sounding brass or a tinkling cymbal, signifying nothing. The only question is this: which “family values” Republican will be the next to be hoist on his own pe-er, um-tard? Give me an honest lech every day of the week and twice on Sundays. The 15-year-old boy was shot in the abdomen with a small-caliber handgun shortly before 6 p.m. in the 200 block of Cedar Street, according to Sgt. Charlie Spruill. The boy was taken to a hospital, where he is undergoing surgery and is listed in stable condition, Spruill said. . . . The father appears to have been examining the gun, which was legally owned, to determine if it was in working order when it accidentally discharged, Spruill said. No arrest has been made as of this evening. I think we are all coming to realize the web in all its manifestations is a sucking time hole. Gwendolyn Seidman puts Facebook on the couch at Psychology Today Blogs. Over the last five years, judges have ordered nearly $951,000 in restitution from recipients who defrauded benefits programs, or about $190,000 a year. During the same time, the state has recovered nearly $61 million in state and federal money from providers for Medicare fraud, or more than $12 million a year. Following the money, the focus should be on provider fraud, not demonizing individual recipients of benefits.